In modern medical ethics and clinical practice in western societies, the autonomy of patients and their right to accept or to refuse an offered treatment is acknowledged and respected. Prerequisite, however, for the right of a patient to consent to any medical act is the existence of the patient’s capacity to make a decision whether or not to consent to a medical act . A patient is capable of making such decisions when he/she has the ability to drive at logical decisions, which requires the ability to recruit information related to the decision, the ability to understand this information and to be guided by such a decision, which subsequently the patient has also the ability to express . The assessment of a patient’s capacity to decide in regard of his/her treatment has emerged as one of the most important legal and ethical issues in contemporary clinical practice. In the last two decades, an increasing number of reports have been edited with the aim of assessing the decision-making capacity of different groups of patients [3-5], the study of factors affecting capacity [6, 7], the need for reliable tools  etc. In Greece, the study of decision-making capacity is limited to legal texts and reviews of the international medical literature, and even some research studies [9-11]. This is probable due to the fact that in Greek legal framework decision-making capacity has not been separated from the general concept of competence . According to Greek legislation age and health, both physical and mental, constitute the criteria for competence. People are labeled by law as fully competent, fully incompetent and partially competent to act, according to age and the degree of severity of physical or mental morbidity. The concept of transient incompetence also exists in Greek legislation, meaning that at a particular time-point the person may not be capable of acting, because he/she is not fully aware of the actions, e.g. due to alcohol or drug toxicity, mental disturbance, or confusion. The aim of this study was to investigate the ability of patients hospitalized in an internal medicine ward of a General Hospital in Greece to make valid decisions about their treatment, as defined in contemporary western societies . More specifically, the objective of the study was to investigate the level of treatment decision-making capacity of these patients for their treatment, and also to explore its correlation with other demographic or clinical variables. An additional aim of our research was to inquire for the opinion of the treating physicians about the capacity of their patients. For the definition of treatment decision we used the methodology described by Owen et al. , in which the treatment decision was the most recently used intervention to investigate or treat the main reason for admission (such as intravenous antibiotics or an endoscopy). The study was conducted in the 24-bed ward of Internal Medicine in the General Hospital of Arta, north-west Greece. The ward is usually over-crowded with bed completeness almost at 120%. All adult patients admitted in the unit from December 2011 to January 2012 were eligible for participation in the study. Patients were excluded if they were non-Greek speaking, if they were unwilling to participate, if their condition was too critical to be interviewed (that is patients with severe hemodynamic instability such as patients with low or unstable blood pressure, low or unstable heart rate and severe respiratory distress), and if they were admitted for monitoring or the performance of laboratory tests only, and not for the treatment of a diagnosable disease. Patients who were in coma or unconscious, those with severe cognitive impairment as those who were unable to recall their name and patients with Wernicke’s aphasia who had impairment in the comprehension of speech and were unable to communicate verbally were considered by the authors and treating physicians to have evident incapacity and were rated as "evident not capable". In this way, a total of 134 patients were approached about participation from which 56 patients were considered as "evident not capable" and 78 patients were interviewed and undergone further clinical assessment. Demographic information was obtained for the interviewed patients. Patients’ interviews and the examination of their decision-making capacity were held within the first 72 h of admission by a consultant psychiatrist, trained in performing the MacCAT-T. Each patient was assessed with the use of the Greek version of the MacCAT–T , and the MMSE. The hospital's ethics committee approved the study protocol and after full explanation of the study, signed informed consent for participation in the survey was obtained from all participants or in cases of evident incapacity from a family member. The way that patients were included in the study is presented in the chart-flow (Fig. 1). The recruitment flowchart of the patients of the study. For the estimation of patients’ treatment decision making capacity the Greek version of the MacCAT-T was used, which has been recently translated and validated by our team, after permission of the publisher, who is the owner of the copyright, the Professional Resource Exchange, Inc. The validity and reliability of the Greek version of the MacCAT-T had been tested in a sample of 39 psychiatric inpatients and the results on the rating of MacCAT-T demonstrated excellent interrater reliability, suggesting that this tool is a practical, reliable, and valid instrument that can provide a standardized measure for assessing treatment decision capacity in Greek psychiatric patients, and can be used for evaluation in clinical practice . The MacCAT–T is the most widely used questionnaire for the assessment of the decision making capacity. It is a semi-structured interview, usually requiring about 15 to 20 minutes to complete plus 2-3 minutes to rate, that provides relevant information disclosures to patients about their illness, the nature of treatment options and their risks and benefits. It guides the clinician through a disclosure of patients’ own disorders and treatment options. Questions to the patient require feedback, and this is used to assess the degree to which patients understand the information (Understanding) and recognize (Appreciating) the relevance of the information for their own situation. In this way the clinician subsequently led to the discovery of the logical process by which the patient has taken the decision to be treated (Reasoning). Finally, the patient is asked to state a treatment choice, according to everything that has been considered (Expressing a choice). Finally, at the end of the interview, the examiner brings the overall score for each of the four dimensions of the questionnaire: Understanding (with ratings from 0-6), Appreciation (with ratings from 0-4), 0 to 8 for Reasoning and 0-2 for Expressing a choice. During the interview, the examiner (AV) provided information to the patient on the patient’s condition, proposed treatment, and associated risks and benefits of treatment. Patients’ cognitive function was evaluated with the Greek version  of the Mini Mental State Examination (MMSE), the standard screening instrument for the estimation of cognitive function, which has been used in research for several decades worldwide [14, 15]. The cut-off score of the MMSE is 24; scores under 24 are suggestive of cognitive impairment, thus increasing the chance of incapacity. Patients capable of making treatment decisions are expected to have scored more than 24 in the MMSE. Demographic and clinical data was collected for the interviewed participants (n=78), including gender, age, education, marital status, place of residence, reason for hospitalization, and psychiatric history. Their consultant physicians (n=5 experienced physicians) were also asked about their impression regarding patients’ competency in the first 72 hours of admission, based solely on clinical examination, blinded to the study and the results of MacCAT-T and MMSE. The question was “Is your patient competent to decide on his/her treatment”, and the possible answers were "Yes", "No", "Do not know" or physicians could refuse to give an answer. For the statistical analysis of categorical variables we used the Pearson Chi Square test and when the conditions of the test were not fulfilled the Fisher's Exact Test was used. General linear models were used to identify statistically significant factors in the dimensions of the MacCAT-T. Correlations were also made (Partial correlations) for correlating MacCAT-T with MMSE considering the impact of patients’ age. The data were analyzed according to the cut-off score of MMSE, as reported in the literature. The analysis was performed with the use of the statistical package SPSS v.18.0 and STATISTICA 8.0. In each case the level of significance was set at 0.05. The recruitment flowchart in Fig. (1) presents the number of patients initially recruited and the number of patients who were excluded, and the reasons for exclusion. One-hundred and thirty-four patients constituted the initial sample of our study, with fifty six of them (41.8 %) characterized as having “evident incapacity” for decision making (due to medical conditions such as coma, disturbances of consciousness or severe cognitive impairment as patients who were unable to recall their name, and patients with Wernicke’s aphasia who were unable to communicate verbally). Seventy eight patients (58.2%) were further examined with the MacCAT-T, and 12 patients were rated as non- competent, according to their performance on the MacCAT-T and the investigators’ judgment. The demographic and clinical characteristics of those 78 patients are presented in Table 1. The patient group was almost equally male and female, and the mean age of patients was 61.86 years (age range 19-98 years, SD 21.31). A significant proportion of patients (42.4%) were living with a caregiver. Neurological disorders accounted for hospital admission in 24.4% of cases. Seven patients out of the total of 78 (9%) had a history of mental disorder. The average score on the MMSE was 26.4, whereas 20.5% of the patients scored below the cutoff of 24. Patients’ demographic and clinical characteristics. The association between MMSE performance and score on the Understanding and Reasoning dimensions of the MacCAT-T.
Concordance between scoring on MacCAT-T and treating physician’s opinion about decision making capacity. Regarding the assessment of the 78 patients with the MacCAT-T, it seems that the rating to the dimensions Appreciation and Expressing a choice was almost completely homogeneous. In the case of Appreciation all but 2 patients (97.4%) were rated with 4, while for the Expression of a choice all but one rating was 2. For these two dimensions with such a homogeneous distribution of ratings, no further statistical analysis is required. Regarding the other two dimensions, in Understanding, 6 patients out of 78 (7.7%) were rated below 3 and in Reasoning, 10 patients (12.8%) were rated below 4. We attempted to correlate the dimensions of the MacCAT-T with demographic and clinical variables of our sample. As already mentioned, statistical correlations regarding the dimensions of Appreciation and Expression of a choice could not be made, so we examined the possible associations with the other two dimensions, namely Understanding and Reasoning. The analysis showed that statistically significant factors that influence the Understanding were the reason of hospitalization (p = 0.007) and the age (p = 0.036), while the remaining factors (gender, education, marital status, residence) do not affect the outcome. More specifically, older individuals and people suffering from neurological disorders performed worse at Understanding than younger patients and patients suffering from the digestive, renal or drug abuse disorders. The examination of the correlation between Reasoning and variables such as gender, age, education, marital status, residence, reason for hospitalization, showed that the only statistically significant factor is age (p = 0.006), while the other factors do not affect the outcome. Reasoning is inversely related to age; the older the patient, the lower the rating in the dimension of Reasoning. We also investigated the correlation of Understanding and Reasoning with the performance on the MMSE with the use of the Pearson Chi Square. The index Pearson correlation coefficient has statistically significant correlation between the score on the MMSE and the Understanding (p<0.000, correlation=0.767, df=76). This means that we found higher ratings on Understanding for higher scores on MMSE and vice versa. When we examined with partial correlation the effect of age and gender in this correlation, we found that with regard to age, the correlation of MMSE and Understanding remains statistically significant (p<0.001) and positive, although reduced (0.661). This finding is expected, since we used an additional variable. Similarly, regarding the effect of gender, values were for males 0.736 (df=39) and for females 0.783, respectively. In both instances there were no changes observed, thus correlation is statistically significant and positive, regardless the gender. Pearson correlation revealed that there was a statistical significant correlation between MMSE scores and Reasoning (p value<0.001, correlation=0.770), meaning that higher ratings on Reasoning are associated with higher scores on MMSE and vice versa. This correlation remains significant (p<0.001) and positive, with slightly reduced value (0.619), when the effect of age and gender was taken into account (Table 2). Regarding treating physicians’ opinion about their patients’ competence to decide on their treatment, physicians, based solely on clinical examination within the first 72h of admission, with no use of a specific tool, stated that a large proportion 67 (85.9%) of the 78 fully evaluated patients are capable to decide on their treatment, 7 (8,9%) were perceived as incompetent and for 4 (5,1%) they couldn’t decide (Table 3). From the 6 patients who were rated below 3 in the Understanding dimension of the MacCAT-T, physicians identified as incompetent only two and the rest 4 patients were identified as competent. From the 10 patients who were rated below 4 in Reasoning dimension of the MacCAT-T, physicians identified as incompetent only 2 (20%), as competent 6 (60%) and they didn’t answer for the rest 2 (20%). The Fisher's exact test we conducted, showed a statistically significant correlation (p = 0.021) between Reasoning and the opinion of treating physician, while there was no statistically significant correlation with Understanding. These data suggest that reasoning ability constitutes a critical variable for medical inpatients in order to be identified as competent by their treating physicians. This is the first Greek study on the estimation of medical patients’ treatment decision-making capacity, as defined in contemporary western societies, with the use of a reliable and valid tool. Half of the 134 patients who were initially included in our study (68 patients, 50.7 %) were considered as lacking decision making capacity in the first 72 hours of hospitalization. 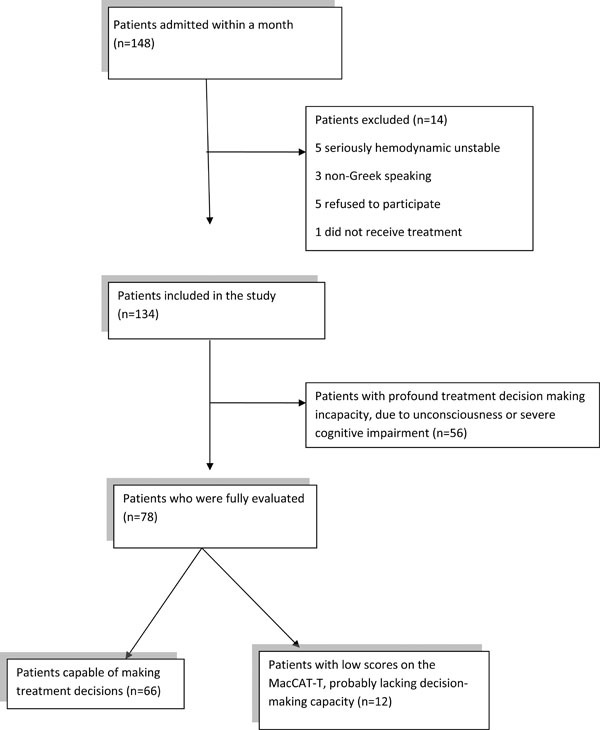 The majority of these 68 patients (n=56, 41.8% of total patients) had evident lack of capacity due to coma, unconsciousness, severe cognitive impairment, or inability to express themselves. The rest 12 patients, (8.9% that is almost one in ten patients of the initial sample), were rated as incapable of making valid decisions about their treatment after their full evaluation with the use of the MacCAT-T. These results suggest that in addition to the evident incapable patients, there is a minority of patients who lack treatment decision making capacity, and that a full assessment is required for their tracing. Fifty-six patients were considered as “evident not capable” due to the severity of their medical condition (unconscious and comatose patients or patients with severe cognitive impairment or inability to express themselves) and were excluded from further evaluation. This may be a limitation of our study, since if these patients were evaluated the rates of incompetent patients in our sample might have been different. However, it is unlikely all these patients, especially the unconscious patients or patients who exhibited severe cognitive impairment (i.e. unable to communicate, to recall their name) to be competent. Although we did not know how many of them would be assessed by MacCAT-T questionnaire as competent, we do not believe this was often the case. As cited in the scientific literature the rates of treatment decision making incapacity depend on the subjects’ sample (patients with schizophrenia, medical patients or healthy community residents), the context in which subjects are examined (outpatients, inpatients or in emergency departments) and the instrument used (MacCAT-T, Aid to Capacity Evaluation, Ontario Competency Questionnaire, Assessment of Consent Capacity for Treatment, Competency Interview Schedule, Structured Interview for Competency Incompetency Assessment Testing and Ranking Inventory etc) [4, 5, 8, 16-19, 20-22]. Some of the original MacArthur studies  on medical and psychiatric patients found that among medical outpatients with coronary heart disease, incapacity was fairly infrequent (12%). Previous studies on hospitalized medical patients have reported rates of treatment decision making incapacity ranging from 9-52 % [5, 6, 14, 15]. Raymont et al. in their study on 159 patients who had been admitted acutely in general medical wards, with the use of the MacCAT-T, found that 31% of all patients interviewed were judged to lack decision making capacity according to English legal standards. In the same study it was found that only one-quarter of the patients who were rated as lacking treatment decision making capacity were identified as such by their treating clinical teams. In their review, Sessums et al. comprised 43 previous studies that evaluated treatment decision-making capacity of adult medical patients without severe mental illnesses. Incapacity was found to be common (18-35%) and often not recognized. Similar studies in general hospitals have reported rates of incapacity even higher, ranging from 9 to 52% [5, 14, 15, 18]. A study on patients who were seen in accident and emergency department  found that when initial capacity assessments were performed, over 60% of patients lacked capacity to consent to treatment. While the rate of incompetent patients evaluated with the MacCAT-T was found to be 8.9% of the initial sample of 134 patients, the total rate of incompetent patients (50.7 %) was much higher, due to the large proportion of patients with an evident lack of capacity. This high rate of patients lacking decision making capacity is in full agreement with the rates already reported in medical literature. These results could be partly attributed to the qualitative characteristics of our sample of patients that use the facilities of Internal Medicine ward of the General Hospital of Arta. That is, as in all district hospitals of the National Health System in Greece, older people with serious health problems are over-represented among the people who use services in public health sector , and in this population treatment decision making incapacity is frequent and more often obvious. Regarding the correlation of patients’ treatment decision making capacity with demographic and clinical characteristics, we found a strong correlation of the MacCAT-T dimensions of Understanding and Reasoning with age and reason for hospitalization, in line with previous research [4, 6, 22]. Performance on the MMSE was also a predictor of capacity, and a strong correlation of the mean score on the MMSE and the ratings on the aforementioned MacCAT-T dimensions was revealed. This finding is also in accordance with previous research which has demonstrated that although the MMSE has not designed for, and is not, a tool for measuring the decision making capacity, however the higher score (>24) increases the probability of having decision making capacity and low score is associated with lack of decision making capacity. From the total of 78 evaluated patients 12 or 15.4% were rated as not capable of making valid decisions about their treatment, according to the MacCAT-T and psychiatrist’s judgment. Treating physicians identified not only lower rates of incompetents (8.9%) but further data examination revealed that the degree of concordance between investigators’ judgment and treating physicians’ impression was poor. This means that physicians identified as incompetent, less and different patients than those rated as such by the investigators. It seems that our results largely confirm that of previous research [6, 18, 23], which showed that only a small proportion (25-42%) of incapable patients in medical wards are recognized by their physician as such. The replication of this finding suggests that a proportion of patients in medical wards of general hospitals are undergoing treatment while they lack capacity to provide valid informed consent. This notion raises important ethical issues in everyday clinical practice in internal medicine wards. Conceivably, the need for further training of physicians on the determination of patients’ treatment decision making capacity is urgent. Our study has some limitations. Apart from the large number of patients considered as “evident not capable” due to the severity of their medical condition, the relative small sample size of fully evaluated patients and the use of only one internal medicine ward, may limit the generalizability of our findings. Another limitation of our study is that the MacCAT-T was not designed to provide by itself a simple binary capacity assessment. The MacCAT-T has no cut-off score for incapacity, and this can be problematic when using its scores for correlation with the opinion of treating physicians. MacCAT-T is not sufficient alone for the identification of the incapable patients and we know that provides some evidence about treatment decision-making capacity together with clinical assessment, including clinical interview and medical records review. Another limitation regards the use of the Greek version of the MacCAT-T in medical patients. Validity and reliability of the Greek version of the MacCAT-T have been tested in psychiatric inpatients, and although it demonstrated good properties in this population, this may not be the case of medical patients without a history of mental disorder, as were the most patients in our sample. This bias limits in part the findings of the present study, and should be taken into account when interpreting the results. It is worth noting that several patients that provided initial consent to study participation turned out to be incapable of making treatment decisions. This may suggest that their consent may have not be valid, although treatment decision making capacity may not be the same concept with the capacity to give consent to participate in research. This issue, however, requires further study. To our knowledge this is the first study carried out in Greece about decision making capacity of medical patients with results largely confirmatory of other studies. The observation that a large number of patients with decision-making incapacity were missed by consultant physicians (using MacCAT-T as gold standard) is potentially important to alert physicians in respecting the autonomy of the patients. Our study showed, with the use of a reliable and valid tool, such as the MacCAT-T, that medical inpatients are sometimes incapable of making decisions regarding their treatment. Moreover, patients’ incapacity sometimes goes unrecognized by treating physicians. The medicolegal context of capacity to make decisions on treatment may vary in different countries but the capacity to consent remains an important ethical and legal aspect of patient care in all settings. It is important clinicians to ensure patients’ capacity and then to facilitate patient involvement in treatment decision making, because patients and their families are ultimately subjected to the outcomes of these decisions. The more informed the capable patients the more engaged to treatment decisions will be, and they are more likely to fully deliberate about the risks and benefits between different treatment options and to be more satisfied with the clinical encounter. Bilanakis N. Psychiatric patients' decision capacity conceptual framework and clinical implications Proceedings of the Psychiatric Association for Eastern Europe and the Balkans Honorary Volume for Prof George Christodoulou. Athens Beta Publications 2011; 1172-80. Grisso T, Appelbaum PS, Eds. Assessing Competence to Consent to Treatment. New York Oxford University Press. 1998. Okai D, Owen G, McGuire H , et al. Mental capacity in psychiatric patients systematic review. Br J Psychiatry 2007; 191: 291-7. Fassassi S, Bianchi Y, Stiefel F, Waeber G. Assessment of the capacity to consent to treatment in patients admitted to acute medical wards. BMC Med Ethics 2009; 10: 15-23. Owen GS, Szmukler G, Richardson G , et al. Decision making capacity for treatment in psychiatric and medical in-patients cross-sectional, comparative study. Br J Psychiatry 2013; 203: 461-7. Raymont V, Bingley W, Buchanan A , et al. Prevelance of mental incapacity in medical inpatients and associated risk factors, cross-sectional study. Lancet 2004; 364: 1421-7. Ruissen A, Widdershoven G, Meynen G, Abma TA, van Balkom AJ. A systematic review of the literature about competence and poor insight. Acta Psychiatr Scand 2012; 125: 103-3. Dunn L, Nowrangi M, Palmer B, Jeste D, Saks E. Assessing Decisional Capacity for Clinical Research or Treatment A Review of Instruments. Am J Psychiatry 2006; 163: 1323-34. Garani-Papadatos T, Ploumbidis D. The meaning of competency in mental health new approaches. Psychiatriki 2005; 16: 257-68. Arapidis K. Evaluation of capacity for transaction of financial nature of mental patients PhD Thesis. Greece University of Thessaloniki 2007. Bilanakis N, Vratsista A, Kalampokis G, Papamichael G, Peritogiannis V. The Greek version of the MacArthur competence assessment tool for treatment reliability and validity.valuation of capacity for treatment decisions in Greek psychiatric patients. Ann Gen Psychiatry 2013; 12: 10. Grisso T, Appelbaum PS, Hill-Fotouni C. The MacCAT- T a clinical tool assess patients' capacities to make treatment decisions. Psychiatr Serv 1997; 48: 1415-9. Fountoulakis KN, Tsolaki M, Hatzi E, Kazis A. Mini-mental State Examination (MMSE).Its application in Greek popultion in patients with dementia. Encephalos 1994; 31: 93-102. Folstein MF, Folstein SE, McHugh PR. Mini-Mental State A practical method for grading the cognitive state of patients for the clinician. J Psychiatr Res 1975; 12: 189-98. Etchells E, Katz MR, Shuchman M , et al. Accuracy of clinical impressions and Mini-Mental State Exam scores for assessing capacity to consent to major medical treatment.Comparison with criterion standard psychiatric assessments. Psychosomatics 1997; 38: 239-45. Kitamura F, Tomoda A, Tsukada K , et al. Method for assessment of competency to consent in the mentally ill Rationale, development, and comparison with the medically ill. Int J Law Psychiatry 1998; 21: 223-44. Grisso T, Appelbaum PS. Comparison of standards for assessing patients' capacities to make treatment decisions. Am J Psychiatry 1995; 152: 1033-7. Sessums LL, Zembrzuska H, Jackson JL. Does this patient have medical decision-making capacityκ. JAMA 2011; 27: 420-7. Rahman M, Evans KE, Akif N, Gerard DA. Mental incapacity in hospitalized patients undergoing percutaneous endoscopic gastrostomy insertion. Clin Nutr 2012; 31: 224-9. Jacob R, Clare ICH, Holland AJ, Maimaris C, Gunn M. Self harm, capacity, and refusal of treatment implications for emergency medical practice.A prospective observational study. Emerg Med J 2005; 22: 799-803. Huisman M, Kunst A, Mackenbach J. Socioeconomic inequalities in morbidity among the elderly An European overview. Soc Sci Med 2003; 57: 861-73. Jeste DV, Depp CA, Palmer BW. Magnitude of impairment in decisional capacity in people with schizophrenia compared to normal subjects an overview. Schizophr Bull 2006; 32: 121-8. Linn K, Saver C, O'Connor G, Magee T. Reflections on mental capacity assessments in general hospitals. BMJ Case Rep 2013; 29: 2013.